The New Bright Pro Dirt sub-brand includes vehicles in 1:10th scale, 1:16th scale, and 1:24th scale. Tested here is one of the smallest, cheapest ones, available in Jeep Wrangler, Land Rover LR2, Hummer H3, and Beetle Buggy versions. This is your basic all-terrain style RC car for young kids. It has chevron-treaded tires, racing raphics, and some non-working suspension details. It's a nice looking RC for the price, and it's full function -- none of that old "goes forward, turns in reverse" silliness. Batteries are not included, but it needs just 4 AA's in total, with 2 going in the small kid-sized controller and 2 in the car. 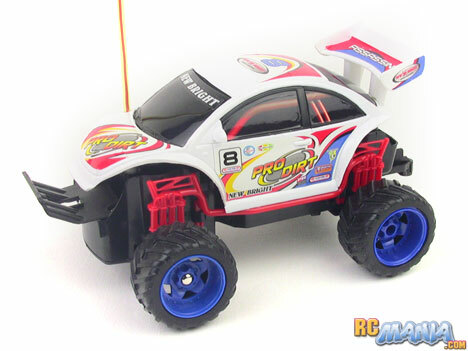 A small off-road styled RC car like this, made for a 4+ year old kid, needs to be able to at least drive well on all floor surfaces you'd find in and immediately arround a house, where he or she will have the most play time with toys. The New Bright Pro Dirt 1:24th scale drives just fine and at a respectable, but safe & controllable speed on linoleum & hardwood floors, concrete & asphalt, and even, I'm happy to report, on low to medium carpet. It has enough ground clearance and large enough tires to get over small bumps and seams between different surfaces and borders between rooms with different flooring styles. Given the specific name of "Pro Dirt," though, I absolutely had to test out the car's off-road abilities, and I'm not going to lie, the name made me expect it to do pretty well on dirt. In reality, it did acceptably well. It's much slower on any sort of rough surface than it is on flat ground, but as long as the dirt doesn't have too many rocks and is fairly level, the car can still get around. On really rough gravel, it slows to a crawl, but still manages to move -- just barely. The New Bright 1:24th scale Pro Dirt RC vehicles are fine for driving indoors, and the price is appropriate. The use of an even number of identical batteries all around is great, as it makes maintaining a stock of alkaline or charged nickel metal-hydride batteries easy. The performance of the vehicle is acceptable around the house, but the "Pro Dirt" monikier is slightly misleading. A more appropriate term would be "pro dirt racer styled." It can drive on dirt, but it's not exactly a pro at it. I think a better deal for just $1 more is the more capable Hi-Rider series of trucks from the same maker, but if a child prefers the styling of one of the Pro Dirt vehicles, I would say go for it. Manufacturer/vendor images, names, & trademarks are copyrights of their lawful owners & used with permission and/or within Fair Use guidelines.